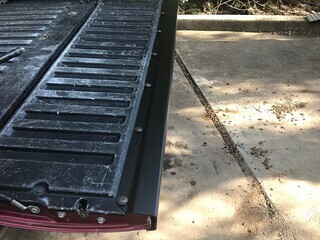 For you guys that have Tacomas, you may know that the tailgate is the worst part that Toyota installed on the truck. Using mine to haul bikes, the tailgate was so flimsy, it seemed like it was about to break in the middle where the ramp sets on it. Well, I'm not about to spend $1200 on a new tailgage but after a little research on the Tacoma forum came up with this fix. If you have a similar issue, I highly recomend this fix. What year(s) are we talkin' about? I have a 2005 and I've never noticed the tailgate seeming weak before. 2013, never had an issue with mine. You guys that dont have issues are lucky and/or careful not to overload the tailgate when down. I sometimes pick up heavy loads of building materials for my work projects, a careless [female] forklift driver damaged mind loading a crate of concrete tile. I now remove my tailgate when loading material using a forklift. 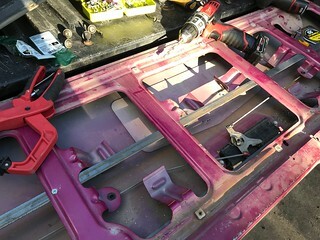 I needed a new tailgate for my Ford F250 when I bought it and read where a lot of the new aftermarket gates were junk as far as those parts were concerned and was glad to find a nice never used takeoff a guy had and had it painted to match. Was told to keep a receipt in the truck till it was painted if I was going to mount it as they seem to get stolen a lot and a cop may be wanting to check you out. Interesting. I need to check mine out. We've had many different bikes in the back, made moves, etc in the 13 years we've had it. We even took it over the pass to silverton in colorado once way back when it was new. I'm pretty sure it's pretty straight but we'll see! Worst part on a Tacoma. . I work part time in a body shop, and one day I picked up a Tacoma front bumper and moved it..! I did not think they used bumpers that thin on cars..